Come and enjoy the Christmas celebrations at Halsway Manor in the company of your MC Gareth Kiddier and chief caller Jane Thomas. The English Contra Dance Band (Gareth on piano plus Linda Game on fiddle) will play for the opening dance, but sadly Linda can’t stay for the duration; but the plus is that Mollie Koenigsberger (fiddle) and Eddy Jay (accordion) then get to join the fun! Somerset choir leader Helen Napper will also be popping in to lead some simple and fun lunchtime harmony singing. We’re also delighted that several of our regular guests – Chris Turner & Elaine Norman, Ted Morse, Pete Hendy, Maureen Knight, not the mention ‘the Elves’ – have all agreed to contribute to the programme – click here for details. Expect enjoyable and varied folk dancing to great music, plus singing, bell-ringing, music workshops, crafts and general merry-making. Plus great food, roaring log fires and convivial company. Bring your instruments and dancing shoes – and walking boots too if you fancy a stroll – and prepare for a very Merry folk Christmas! Everyone who would like to dance, sing and have fun at Christmas! Live locally? We are opening our doors for non-residents to come and enjoy the fun. Jane Thomas has a vivacious personality and is well known for the fun she puts into her calling and dancing. 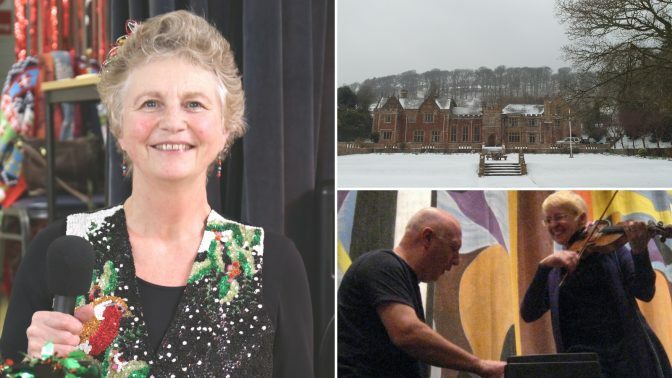 She started calling in 1993 and has called for folk dances and private functions throughout the south west including the Sidmouth Folk Festival. For 25 years she has been instrumental in running the Willand Folk Dance Club. Jane has a wide repertoire of dances and is always looking for the unusual or unexpected twist in a dance. She can cover a wide genre of dances but is probably happiest calling a mixed programme where the longways, squares and sets add to the complexity of the evening’s dance. Gareth Kiddier (piano) has been playing on the folk dance scene for in excess of 15 years and is a passionate dancer, all of which shows in his driving rhythmical support of the dance tunes using well considered harmonic chords. When not with ECDB, he may be heard playing most weekends of the year with The Watch, PolkaWorks and other occasional line-ups. Linda Game (fiddle, mandolin) has been playing folk based music for over 20 years since she escaped from the Classical world! She plays in a number of styles, and with her stunning improvisational ability and rhythmic sense, she’s a particularly exciting dance musician! Helen Napper is a qualified and experienced Senior Speech and Language Therapist. However she’s better known locally for her work as a music coordinator in several West Somerset Primary schools. She has established choirs and school singing sessions, offered group tuition in guitar, ukulele and percussion, all with an emphasis on fun and inclusivity. Richard Jones (accordion, piano) is a founder member of the Climax Ceilidh Band. Before that he played in the Climax Blues Band, who enjoyed worldwide success for their hit single ‘Couldn’t Get it Right’. He has been a member of ground breaking multi-media group Principal Edward’s Magic Theatre, played in Angles (with Cliff Stapleton) and is currently a member of MoltenAmba. Mollie Koenigsberger (fiddle) plays in Double Dichotomy, Fat Harry, Fiddlechicks, and in other combinations, energising and delighting dancers at ceilidhs, barn dances, folk events and festivals across the country.